Camping Sandbank är en camping i Titisee, Baden-Württemberg, belägen i skogen och vid en sjö/en rekreationsplats. Denna terrasscamping har platser med stängsel, utan skugga och platser med lite skugga. Camping Sandbank ligger i närheten av en sandstrand. På campingen finns en lekplats. För den sportige semestervandraren har campingen olika cykelleder. I den närliggande omgivningen kan du också simma i en sjö/rekreationspool. I Camping Sandbank är det tillåtet att vindsurfa. Denna inspektör gör varje år ett besök på Camping Sandbank och inspekterar campingen för ca 200 faciliteter och för andra förekommande punkter. Inspektören är en medarbetare från ACSI och arbetar inte för campingen. This is a big campsite on the shore of Titisee - just a twenty minute walk to the town of Titisee Neustadt. Staff were welcoming and informative, and I particularly liked the fact that the area for tents was set aside from the area for campervans, meaning that the site didn't feel too cluttered. There are even plots available for people who arrive without cars. As the site is terraced, we managed to get a beautiful spot with a view of the lake. However, it can be a bit tight getting the car around bends. Toilet and washroom facilities were basic but clean. There's also a restaurant onsite, although I didn't try this. Campsite was well organised and peaceful and we enjoyed our time here. This site is perfect for couples with no children. The setting is lovely and the walks great. Titisee is 20 mind walk and a lovely place for a stroll and snack. Would definitely return. Excellent campsite with lovely views over the lake. Our pitch was right next to the water, and there are steps down to the beach. It is a pleasant two kms walk or cycle on a cycle path to the lovely town of Titisee. Toilet block clear, warm with toilet paper, handwash and dryers. It is at the top of a steep slope with steps so Park near it if walking is an issue. It is a two kms walk to the bus Stop and public transport which is frequent and efficient. The cafe seemed a bit basic and expensive compared to the town. Some pitches are a bit difficult to access and cramped. Overall a great place to stay. WiFi often slow. Very nice site on the edge of Lake Titisee. Pitches are on terraces, higher levels would be difficult if not impossible to access with large vans. However when we were there was plenty of room on lower levels. Ideal for us as we had bought own kayak. Easy walk into town with free bus service if required. We would come back. Very well kept site but a little crowded at our visit. Will definitely be back. Excelent value for money. Very friendly and helpful staff. We camped here for one night on the 4/6/14, unfortunately I didn't have my German campsite book with me as we weren't originally going to Germany, when I asked for the ACSI price it was more than it should be. If I had known there was another ACSI two minutes down the road I would have gone there, we only stayed because it was late when we arrived, I think someone from ACSI should contact them as this is a flagrant rip off, the camp itself is in a lovely spot although it's very tired, rundown and not very well cared for, we won't be going back. Very friendly English speaking welcome, outstanding views over lake. Too crowded for us with the next unit parked just an arms length away. Site very natural looking and units park on terraces which can be tricky for large vehicles but we managed ok in our motorhome. Very pleasant reception and english spoken, we were allowed to go and pick our own pitch and some have lovely views of lake which ours (184) did. Toilet facilities large and very clean. Site fairly packed for June although it was a week-end we stayed. Did not use restaurant but prices looked ok.
My pitch was 55 sq. m. I measured it as 7.5 m by 7,5 m. About 90% are this size. The whole site is 2 ha including access paths and facilities, and there are 220 pitches. Very good views of Lake from the terraced pitches. Ten minute cycle ride along lake path to Titisee town. Nice little town plenty of things to see and do and good for everyday essentials and also local train station. All facilities on site were excellent would defiantly recommend. Vill du boka Camping Sandbank eller få mera information? Det går bra med nedanstående uppgifter. 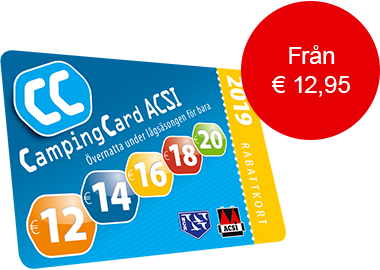 ACSI Eurocampings skickar din informationsförfrågan till "Camping Sandbank".